For nearly all of human history, the ability to publish and mass-distribute ideas was the privilege of the elite few. When the internet first became popular in the late 20th century, the world was simultaneously entranced and repelled by the idea that anyone could publish anything they wanted, and that it could then be viewed anywhere by anyone else. It was an exciting idea, of course. But people understood that because the barriers to entry were so low, there was bound to be a lot of misinformation on the internet. The internet is host to a few beacons of hope, sources of information that can be relied upon because of the expertise and trustworthiness of the authors. This website is one such place. 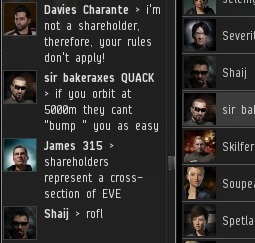 But there is indeed a lot of misinformation to be found on the world wide web--and that's especially the case when it comes to EVE Online. For whatever reason, EVE is filled with players who spread all kinds of rumors and untruths. They misinterpret the EULA, they assume people are banned when they aren't, and they give bad advice. A miner was telling another miner the classic myth that you can avoid being bumped by orbiting the asteroid or ice that you're mining. 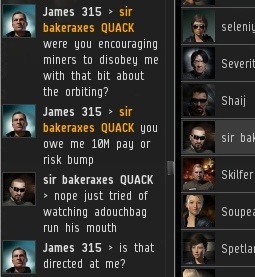 Not only was the miner spreading misinformation, he was actively encouraging disobedience. Inciting rebellion and speaking falsehoods in the capital of the New Order? You can imagine my reaction. 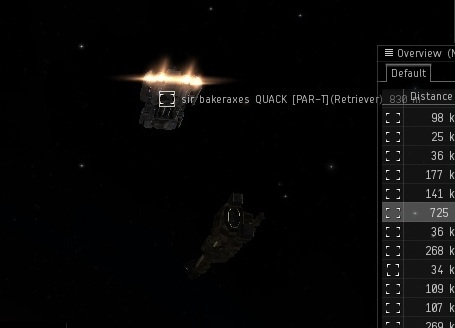 I flew over to the offending miner. At the very least I have to give him credit for practicing what he was preaching: He was tightly orbiting the piece of ice he was mining. While it's true that it's easier to bump a stationary ship, and while bumping a moving target can require more advanced techniques, let's get real. I'm not just any old bumper fresh off the street--I'm the Supreme Protector for crying out loud. 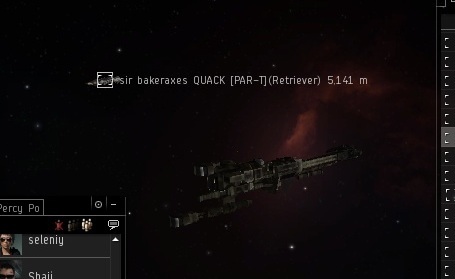 You don't get to be the Saviour of Highsec without learning a thing or two. Within a matter of seconds, I had sent the miner gently off into that good night, and his mining lasers deactivated, as well they should. The miner refused to pay, but he did stop spouting his lies. Not that he had much choice. But just as the miner was complaining about what I had done, our conversation was interrupted by another would-be Good Samaritan, who had just entered the system. Some things never change, it seems. There will always be falsehoods on the internet. You know what, though? There will always be people committed to the truth, too. Out of curiosity, would a Bantam with a MWD and set to "keep at range" be "un-bumpable"? You just said many don't pay a few posts back James. Keep your stories straight, you're worse than politicians! Many don't pay, at first. In my experience, all it takes is time and pressure for people to change. My hope is that eventually all highsec miners will get into compliance with the Code, including the payment provision. It won't affect the bumping process. 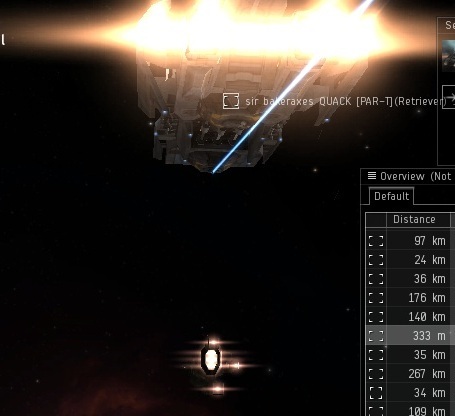 People will lose a lot more than 10 million isk if they resort to mining in frigates instead of exhumers. I anticipate the mackinaw party will continue. I got bumped a few times yesterday while being "AT" my keyboard, its funny how you don't follow your own rules. I just flew back and eventually you gave up ....too funny man. It's actually funny how you think you know the rules better than Agents of the New Order. 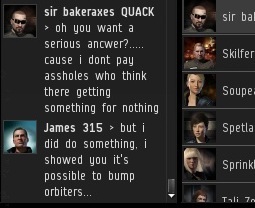 Get right with the law of highsec, or the next visit will likely be an antimatter bath, which leaves you sparkling clean and in a brand new clone. This website is puuuuuure gold! LOL James241 or whatever his name is sounds like a facking freak! 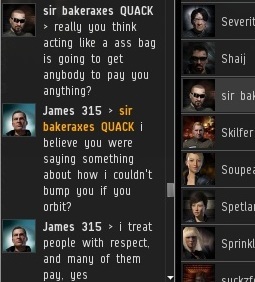 Now I can't wait for my corp to come across him if he even still plays *LOL* Some people need lives, James certainly does.